As Congress comes to a decision on whether to give President Barack Obama broad negotiating powers on trade, our new Pew Research Center report shows that while Americans favor the Trans-Pacific Partnership (TPP), they are among the least likely to support it in the nine TPP nations surveyed. 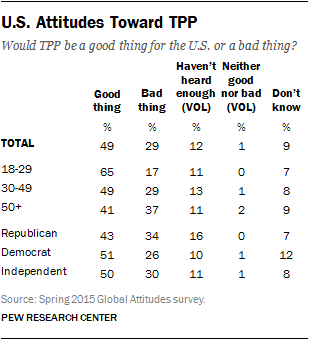 And, as with many issues in the U.S., there is a partisan divide on support for TPP. Overall, 49% of Americans say that TPP would be a good thing for their country, while 29% think it would be a bad thing. When the survey was administered in April and May, the debate over giving Obama fast-track authority — which would enhance his ability to negotiate TPP without fear of it being modified by Congress — had not yet gained the full attention of Americans. Consequently, 12% volunteered that they had not heard enough about TPP to make a judgment, and a further 9% did not answer the question. In general, Americans see free trade agreements as good for the country. However, support for this free trade agreement is much more robust in most other TPP nations surveyed. This includes two-thirds or more of Vietnamese (89% good thing), Peruvians (70%) and Chileans (67%). And at least half or more in Mexico (61%), Japan (53%), Australia (52%) and Canada (52%) also support the deal. In Malaysia, only 38% support the agreement, but that is due in part to 31% volunteering that they have not heard enough. Within the U.S., there are partisan differences on support for TPP. Democrats (51%) are slightly more willing to support the trade negotiations compared with Republicans (43%), while half of independents show their support. There is also an age gap. Younger Americans are much more likely to support the partnership (65% good thing) compared with older Americans (41%). Additionally, there are differences by gender on support for TPP, with men more likely to support Obama’s ambitious trade agenda. However, there are no significant differences on this question among lower- and higher-income Americans and between higher- and lower-educated people.